In Piping Press I found the following about P/M Dan MacLeod who served in the Black Watch during WW1. 3rd Battalion Dundee Home Guard: After they had been established Home Guard units were permitted to wear the hat badge of their local regiment. In Dundee that could only have been the Black Watch, and any veterans in it would have been ex-Black Watch, not Dad’s Army [reference to a popular UK comedy show of the 70s and 80s]. P/M Dan Macleod: Transferred from 7 Royal Scots to 4 Black Watch when he moved from Edinburgh to work for D C Thomson in Dundee. Piped battalion onto action at Loos and won Military Medal for rescuing wounded men after the attack on 25 Sept 1915. Won a bar in 1917 for similar acts of gallantry. Joined Home Guard in WW2 and formed pipe band. Does anyone have more information about P/M MacLeod, such as his first/middle names and when he served as P/M in the Black Watch and Dundee Home Guard and which battalions? 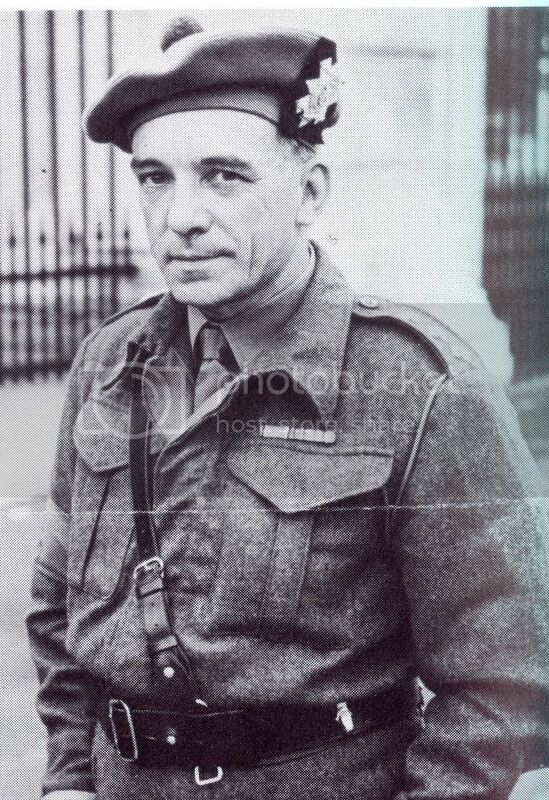 Hi Aad, no information on PM MacLeod but as you mention Home Guard units wearing hat badges of local regiments. Here is a picture of Cpt C.A.Sutherland MBE in the Home Guard wearing a Victorian officers badge with straight scrolls at the top. The most remarkable fact is he lost both his legs 6/3/18 whilst serving with the 4/5th Bn. Picture is from British Army Uniforms of WW2 by Brian.L.Davis. Piper Dan McLeod embarked for France with the 4th TF Bn aboard the SS Rossetti on the 25th February 1915. His service records didn’t survive the London Blitz. I can’t find out when he was promoted to Pipe Sergeant. He signed a Burns Supper menu Pipe Major Dan A McLeod dated 4th January 1917 at Poperinghe (sic). The menu was written and illustrated by Joseph Lee. Joe Lee is the subject of a book called FIGHTER WRITER by Dan Burrows. Breedon Books. Joe Lee’s book of poems “Work a Day Warriors” p65 The Haggis, is headed by these words. “To Mrs M---, to whom we were indebted for a haggis, whose amplitude was in somewise commensurate with the largeness of the heart. I am sure Mrs M was Dan’s wife, he was piper for the supper and a friend of Lee. Dan McLeod like many of the battalion worked for the “Dundee Courier” he was a process block maker. He lived in Balfour Street, Dundee. Somewhere I have a letter from Dan to a relative of Jock Troup, he explained how he took Jock aged 17 out to bury his father Drum Sergeant Archie Troup. Amazing bit of Sleuthing Tam, well done mate. War does not decide who is right , only who is left. I am the granddaughter of Pipe Major Daniel Alexander McLeod, 4/5 Black Watch and 5th Battalion Dundee Home Guard. In preparing for commemoration of the centenary of the Armistice, a colleague and I have been reading over Dan's diaries, which he kept every day throughout his service in the First World War. My colleague found this thread on the internet and I am replying in case this is of interest to members of this forum. His diaries include his promotion dates, as mentioned in the thread, and also his record of his experiences and service until his demobilisation on 19 January 1919. He and his comrades are very much in our thoughts at this time. Hi Gill and welcome to the Black Watch Forums. What a great piece of history you have with Dan's diaries. I for one am interested in hearing about Dan's experiences. Hi Gill Welcome to the BW site look forward to reading about Dan's experiences. I am compiling a list of Pipe Majors of military Pipes & Drums worldwide. I have your grandfather listed as born 1891 Keig, Aberdeenshire and died 1968 Aberdeen. Could you confirm that he was P/M of the 4/5th Bn Black Watch from 1916 to 1919? As far as his service in the Home Guard is concerned, I have him listed as P/M of the 3rd City of Dundee Bn and I have no knowledge of there having been a 5th Bn. Was he their P/M for the full duration of the war, so from 1940 to 1944?